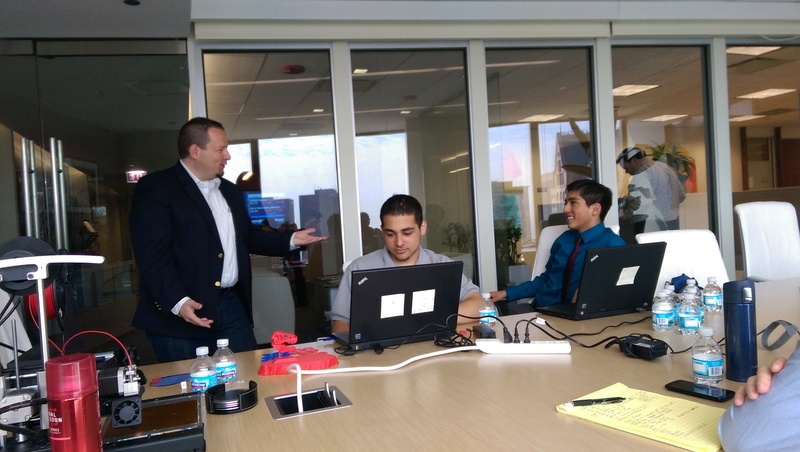 Students at Job Shadow Day Get a Taste for Tech at SPR! As I headed into SPR’s offices in the Willis Tower early on Friday, April 17th I noticed a well-dressed young guy in our lobby. He seemed very natural and relaxed, and I had to stifle my assumption that he was one of our students for Job Shadow Day – a program of the Mayor’s Office for People with Disabilities (MOPD) and CPS. Students are required to first participate in Disability Mentoring Day in their school before qualifying to take advantage of Job Shadow Day. SPR has participated in Job Shadow Day for years as part of our support for people with disabilities and our commitment to Civic Engagement. This guy carried himself with an ease and professional demeanor that belied his youth. Maybe he was a young phenom developer or recruiter. Looking again, I realized he must be one of our students and introduced myself. Marvyn Vargas grasped my hand in a firm but not overpowering shake – reflecting acumen beyond his years – and introduced himself. I invited him into our main conference room and asked why he was so early as it was nearly an hour before our official start. He told me that he had to take a train to a couple of buses to get to the Tower from his home, and he didn’t want to be late. I wanted to hug this guy! We sat and chatted for ten minutes while I got organized, and he explained his interest in technology from the perspective of his learning challenges in school. He is a junior at CICS Northtown Academy, one of Chicago’s college prep charter schools. The first sentence of their About Us reads, “CICS Northtown Academy is a college preparatory high school that provides students the opportunity to explore and grow in a safe, caring and challenging environment”. It’s hard to argue with that mission, however, my first thought was how sad that our kids’ safety had to be called out front and center in a high-school mission statement. But the truth is that, for many students attending high school in Chicago or other large cities, this is reality. They are exposed to violence in many communities, and they and their parents need to know that they are safe while laying the foundation for their futures in school. After CPS Transition Specialist Ryan Driscoll arrived with Edmundo Pujol, another third year student at CICS Northtown, we got underway. Edmundo had also arrived at the Willis Tower in time for our start, but Ryan had remained in the Tower lobby with him as they awaited the arrival of other students who were scheduled to join us. Unfortunately a couple of the students weren’t able to join us, but Edmundo and Marvyn had passed the first screen for any job or career success – show up on time. 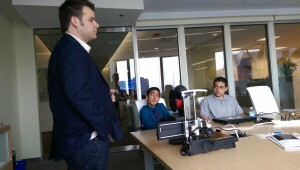 The day officially began with Matt Mead, SPR CTO and avid tech enthusiast welcoming Edmundo and Marvyn to SPR. He shared his passion for the tech industry while a small 3d printer – the Printrbot Simple Metal – whirred and danced on the conference table in front of him, forming an as-yet undefined object on its plate-sized grid. Matt had brought several creations from the bot and dropped them on the table in front of the students before plugging it in and flipping it on for show and tell. Among these was a bust of him on a small mount which he introduced by saying something like, “I know it seems self-serving to bring in a bust of yourself to introduce 3d printing, but this illustrates the need for the printer to have a foundation or platform on which to create”. I actually thought Matt’s bust bore an eerie resemblance to JFK. He explained that the underlying 3d model for the bust was created by linking a Microsoft Kinect sensor and sophisticated 3d software to a computer to capture the 3d scans. I have since learned that SPR’s Makers Club, a group of maker enthusiasts who meet informally after hours, have created many complex objects including functional model rockets, models of atoms, and even reproduced works of 3d art from the Art Institute of Chicago and the Smithsonian Museums! They’ve also created add-ons to the printer itself including stabilizing feet, filament guides, and a camera housing to take time lapse photos of the process. The prints that Matt was proudest of were a battery compartment for the SPR drone (quadcopter) that the team had built and a custom enclosure that holds a credit-card sized Raspberry Pi computer that will run Windows 10 and, through a passive infrared sensor, is planned to monitor SPR conference room occupancy. This data will be available in the cloud through Microsoft Azure. Ultimately, this information will be linked to our Office 365 remote conference scheduling system so that SPR executives can both schedule meetings strategically and know real-time whether a conference room is occupied. The kids connected quickly with Matt and he asked each of them to share why technology appealed to them. Both shared their interest in creative thinking and hands-on learning, while relating their respective challenges with some traditional aspects of education. Leaving the printer to its work, Matt headed to a meeting, noting that he’d stop back to check on the printer. Chris Kabat, VP for Enterprise Platforms and Managed Services, had joined the group during Matt’s introduction and now took center stage. Much like Matt, he connects easily with young people and Chris quickly had them into a coding exercise on their laptops. 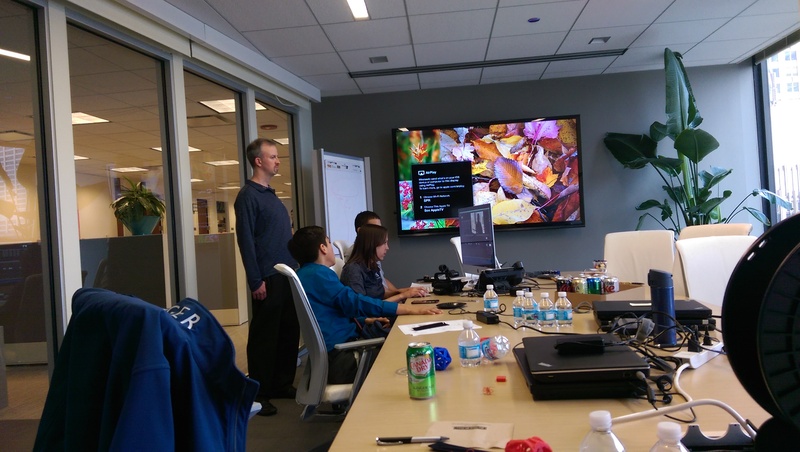 The exercise was one of many available on line and associated with the Hour of Code program. Over the next 90 minutes, Marvyn and Edmundo were exposed to concepts such as defining variables, setting off instructions of code, the importance of being exacting in development, and multiple ways to achieve the same outcome in a line of code. They created various geometric objects like a circle, square and rectangle, and then manipulated them within an x,y grid as instructed by definitions of the variables as well as placement instructions. While they were learning some fundamental requirements of developing, Chris was also introducing them to more subtle concepts like paired programming, the need to take risks or think creatively to learn – without fear of failing, and the gratifying feeling that comes from seeing the output of your code successfully run. We were all impressed that these two high-school students who hadn’t done any real coding before this experience were quickly absorbing and applying this new knowledge. Video Blogging – Can the day get any Better? As lunch arrived, so did Gina Figliulo and Brian Chorba, part of SPR’s Marketing Department, with an array of gear that would be required over the next 90 minutes. SPR President Doug Rossier stopped by for a brief visit, explaining his role in helping to assure that the company was meeting both its short-term and strategic financial targets while overseeing other core challenges like company culture, industry trends and employee growth. After viewing some brief videos that Gina and the SPR marketing team had created to strengthen and extend our brand, the students were tasked with creating their own short scripts to reflect their brand or passions. As their respective blog themes, Marvyn related his love of cross-country running as a way to free his mind of distractions and bring clarity, while Edmundo shared his draw to biking as both an efficient way to get around in the city and a form of independence. With scripts in hand, it was time to get in front of the camera, and they were instructed on some of the nuances of setting a shot – lighting, background and the mechanics of the camera itself. Each filmed the other as they taped. Gina then imported the footage into an iMac for editing with Final Cut Pro X, Apple’s professional video editing software, while giving the students a quick tutorial on the sophisticated tool. Adding first the SPR logo animation and titles to the lower thirds, the short videos began to come together. The monitor was alive with silos of animated graphic and audio data, a spectrum of color and sound. Marvyn and Edmundo embraced the process, seeing their work come to life through the combination of technology and professional editing skill. The files were then exported into .Mov format for viewing. The final product was just a few short minutes, but the experience was worthy of a filmfest honor. What’s a Job Shadow Day without some SWAG? As Brian and Gina began breaking down the equipment to return it to their studio, Ryan, Marvyn and Edmundo began collecting their things to head out. For us, Job Shadow Day began a couple of months back, and included creating a strategy for the day with support from SPR Marketing Manager Rebecca Butman, working with SPR executives to calendar their time and fashioning and refashioning an agenda while working with MOPD and CPS representatives to assure that the day we had planned was consistent with their interests – and those of the students. In the end, we presented the students with a wealth of IT career knowledge in a hands-on showcase over a 4-hour window with the generous support and decades of experience of the SPR team. Brian handed the young men an SPR gift bag including a slick, metallic SPR-branded portable device recharger – not your typical conference swag – and a 1″ square replica of the SPR Consulting logo raised on its resin foundation fresh from the Printrbot. A fitting end to their tech-intensive experience at SPR. Prev Students at Job Shadow Day Get a Taste for Tech at SPR!